Barnes & Noble boss Steve Riggio has been quoted as saying that eliminating returns would "revolutionize the book business and revitalize the book business ... We'd like to see this practice discontinued ... Any rational business person looking at this practice would think the industry has gone mad." US readers can confidently multiply all numbers by 10, since their book publishing industry is 15 to 20 times the size of Canada's. Think about waste -- and potential savings -- of over $3 BILLION annually! Jeffrey Trachtenberg of THE WALL STREET JOURNAL says, "Returns are the dark side of the book world, marking not only failed expectations, but the crippling inefficiencies of an antiquated business. It's a problem that's only getting worse." WHAT IS THE BASIS FOR THE CALCULATIONS? "I was amazed when researching the scope of waste that no one had ever done a comprehensive audit or estimation of the total cost to the industry from selling books on consignment," said Bruce Batchelor. "It was as if I was asking about the holy grail in the Vatican. If I talked to printers, they were quite frank about not having any hard data, but offered their serious estimations -- as business people -- that returnability was handicapping publishers between 10 percent and 20 percent of gross sales. I was puzzled about the secrecy, and the reluctance to face this problem, by publishers, booksellers, government folks, academics. 'That's how it has always been,' everyone said. 'It's not that bad and, besides, it will never change.'" When I checked at a leading university masters-in-publishing program, the dean could provide no studies, no theses, no research files, that had focussed on calculating actual costs and waste. It was bizarre: here was the industry's biggest -- and most obvious to an outsider -- problem, and no one would look it in the eye. BookNet Canada recently did a survey that included questions about returnability, but refused my request that they gather quantitative data. "Finally I had to interview publishers and booksellers and others in the industry myself. It was the people who worked for distributors who were the most forthcoming -- they were the ones who confirmed everyone's worst suspicions, that the percent returned was horrifically high. For some genres -- such as mass market fiction -- returns can run up to 85 percent for some titles. For other genres, 40 percent was fairly typical in their experience. "It seems to be fairly common across the industry for people to ignore the worst examples -- the ones where tens, or even hundreds, of thousands of copies are pulped. It's human nature to focus on the positive experiences, and sweep the stinkeroos under the rug. Plus people working for smaller bookstores generally order more prudently and return fewer books, so their ideas of industry-wide waste generally under-estimate the overall picture. Ironically it is these small booksellers who are underwriting the massive returns from the largest bookseller, because the smaller bookseller isn't getting as much discount as he or she would if consignment selling was ended. "What is vitally important, to me, is that we all agree that the wasted time, money, resources, opportunities are massive -- even if they are one-quarter or even one-tenth of my figures -- and must be ended. Then we can work toward quickly changing this broken business model, so the industry can be healthier heading into the building perfect storm of pressures." Our thanks to the late Derek Weiler, editor of Quill & Quire magazine, for commissioning an op-ed article on this important topic, and contributing suggestions about implementing change. The centre column story, "Creating a DIY bailout of $330 Million per year" by publishing innovator Bruce T. Batchelor, is the draft op-ed piece which never ran in the magazine (Q&Q dropped the entire series of provocative op-ed pieces after Derek's death). There is no problem with the content coming from Canada's book publishing industry -- international awards demonstrate that the writing and presentation are clearly a tribute to our citizens' wondrous creativity. Unfortunately the underlying business model for publishing is woefully broken, as evidenced by numerous store closures, distributor collapses, and the massive cutbacks and some failures at publishing houses. If everyone stays the course, a 'perfect storm' of external pressures will devastate this essential cultural sector. Yet, with one simple and bold move, Canadian publishers and booksellers can alter the business model to become profitable and better positioned for the inevitable transition from mostly printed books to mostly digital products. A simple business model change will result in cost savings of over $330 million per year to be divvied up between booksellers and publishers. No grant applications, no strings attached. Fully implemented within six months. Want a share of that pie? Do you want to help decide how the savings are allocated? If so, now is the time to get involved in negotiating the new sales terms. A better business model has been hidden, right under our noses, for over seven decades. The solution is to revert to how book business was conducted before the Great Depression, matching how goods are sold in almost every other retail sector -- i.e., using 'firm sales' rather than 'returnable' (consignment) terms, and increasing the basic retailer's discount to 50%. This change will trigger an end to hundreds of millions of dollars in overprinting and other wasted time and resources. One challenge is that no one holding an executive position in publishing today can remember anything but returnable books. "That's how it has always been" is a common misconception. What began as a temporary sales gimmick by a desperate New York publisher back in the 1930s to "guarantee your sales" -- i.e., "you can return unsold books for an exchange or refund" -- spread like an infection, handicapping an entire industry for the next seven decades in an unfortunate practice that has wasted literally billions of dollars worldwide. Operations are distorted and complicated by work-arounds and kludges to survive in a broken business model. In good times, no one noticed or cared about inefficiencies even of this scale; however, we are in 'good times' no longer. In most industries, manufacturers and producers sell to retailers on firm terms, at 50% discount or more. If the product isn't selling well, it is steadily reduced in price until someone buys it. With rare exceptions, merchants can't send products 'back up the distribution pipeline' especially if the item is perishable or seasonal (such as a banana or Christmas lights). Yet bookstores buy their product at a mere 40% discount off the retail price (paying 60% of the retail price plus shipping costs), putting themselves at a huge, increasingly lethal disadvantage compared to other retailers. Other than bookstores, only the music stores sell new product on consignment -- and look at what financial shape they are in now (if you can find any that haven't closed). At some point, consumers will become aware of the horrendous environmental impact caused by overprinting, and may express their displeasure by buying fewer printed books [possibly even staging boycotts to demand more responsible behaviour]. What's the basis for the figure of $330 million? We begin with the statistic that annual book sales in Canada are about $1.6 billion [2006 figures]. Publishers allocate between 12% to 20% of the retail price for manufacturing. Therefore printing costs between $200 and $300 million for those copies sold. Yet returns (and eventual shredding) reportedly run between 40% and 80%. 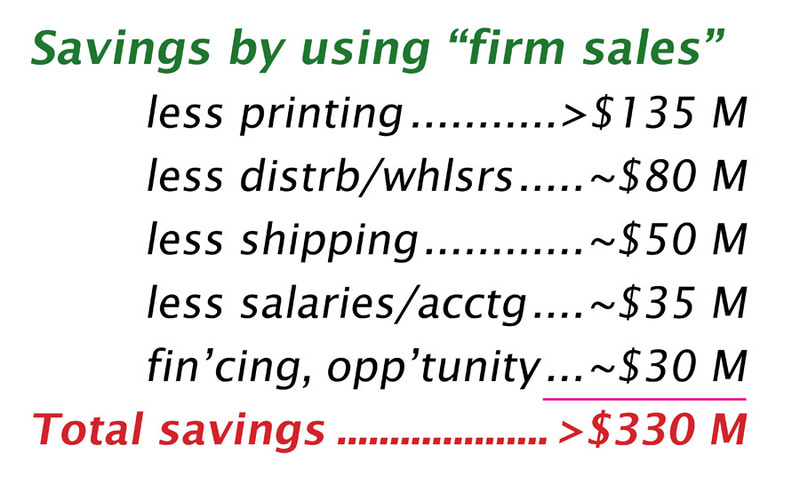 A minute with a calculator reveals that, quite conservatively, overprinting squanders over $135 million annually! Yet that's just the start of our money trail. Consider next the cost for distributors and wholesalers to receive, account for, re-stock and store unwanted books. That's over half of what wholesalers do -- so publishers could renegotiate contracts and save roughly $80 million of the margin they grant to distributors and wholesalers, simply by ending returnability. Now add on around $2.00 per book for the shipping costs retailers pay to bring in and then return each excess book, for another $50 million that could be saved. Staff time devoted to inventorying, pulling, packing and bookkeeping of returns costs more than $35 million every year. Potential savings on interest and the lost opportunity cost of publishers' investments are estimated at about $30 million. By ending returnability, $330 million will be available as a do-it-ourselves industry bailout every year. Will Canada's publishers declare an end to these consignment sales, and grant the bookstores an extra 8% to 10% discount? Can they afford not to? Who wins? The financial beneficiaries of change will be publishers and retailers (hey, maybe authors could get more royalties too!). Consider a small independent bookstore that doesn't grossly over-order right now, and is existing on 3% profit margin (if that) while buying new books at 60 cents on the dollar of retail price -- on the current consignment terms. With the new terms, this bookstore will be paying only 50 cents. Presto, this store is suddenly making a robust 13% margin! Actually more because the store isn't paying for the shipping for books being sent back. Instead, it is marking down the retail price for the books that don't sell and still making money on these 'duds' or 'extras' that customers see as a great incentive for patronizing the store. The environmental winner will be the planet, as our industry will manufacture and transport tens of millions fewer books each year. Those whose work will be scaled back include paper producers, printing companies, shippers and distributor/wholesalers -- though they'll be serving an industry with fewer unpaid bills and bankruptcies. MAKING CHANGE HAPPEN -- QUICKLY! What would it take to make the switchover? Surprisingly little. There are no books in the system right now with a return allowed period of more than 3 months. We need the major players to sit down and decide the new "deal" for dividing the pie, set a date, issue a notice of the new terms... and it is done. Presto, end of returns. Best to have a few government lawyers in the room so no one gets worried about being accused of "price-fixing". If you want to help fix publishing's broken business model, contact Indigo/Chapters CEO Heather Reisman and Chief Merchant Joel Silver and every publishing executive you know. Urge them to commit to ending returns at the end of 2009. Tell every bookstore owner and manager to contact publishers to request "firm sale, 50% discount" terms. Independent booksellers: you must demand to be represented at the table when the new sales terms are negotiated. $330 million is a lot of money and you deserve to get your fair share. Bruce T. Batchelor is editor and publisher for Agio Publishing House in Victoria, a new model collaborative publishing company. He also provides management consulting services to government, non-profit and publishing industry clients. Fourteen years ago, back in 1995, Batchelor created the world's first print-on-demand based publishing service, Trafford Publishing, which was recently acquired by US competitor Author Solutions Inc. Last year in North America, more titles were published using the print-on-demand publishing approach than by the "conventional" method. Batchelor is an occasional guest lecturer at Simon Fraser University's Canadian Centre for Studies in Publishing. He is a mentor to UVic business students and a Quantum Shift Fellow at University of Western Ontario's Ivey School of Business. He was a finalist for Ernst & Young's Entrepreneur of the Year award. He is also a bestselling author and former magazine editor. He blogs occasionally at www.bookmarketing.agiopublishing.com. 2.7 Million books PER DAY are wasted! Please check out the Facebook campaign: Tell book chains and publishers: Donate, Not Dumpster!. Thousands of consumers and bookstore employees are sending emails to CEOs at the biggest publishing companies and bookstore chains, demanding action. "One billion trashed books a year is a staggering figure. It breaks down to 2.7 million books PER DAY that have been overprinted and are constantly being destroyed by the book industry's insane, outdated system." BookBusinessmag.com ran an article, "The Point of No Returns: The industry explores alternative models for reducing returns. Where will it lead?" in March 2009 by James Sturdivant. Unfortunately, one year later, there is little evidence that publishers and the heads of the biggest chains are really taking responsibility for this incredible environmental and financial scandal. April 24, 2008 by Eve Harvey. Read it here: http://vulpeslibris.wordpress.com/2008/04/24/pulp-fiction-books-and-the-environment/. Arts journalist and publishing commentator Danuta Kean writes: "Next time an author decides to use the national press to attack publishers for not using recycled paper in the manufacture of their books, they should think again. Because, while no one would argue against the use of sustainable materials in book production, it does not cause of the most environmental damage in the book industry. "The elephant in the room when it comes to publishing's carbon footprint is not recycled paper, but the one area authors and publishers are equally reticent to mention: returns. So sensitive are publishers about the issue that none will give figures for their returns or even percentage improvements." Read Danuta's article here: http://www.danutakean.com/blog/?p=223. "I would like to contribute to the general discussion about the footprint of the book industry. Last month was released a new report 'Environmental Trends and Climate Impacts: Findings from the U.S. Book Industry', which is probably the most important report that was published recently on the environmental impacts of the book publishing industry. This 86-page report was prepared by The Green Press Initiative (GPI) and The Book Industry Study Group (BISG). The report analyzes the environmental impacts of the industry and its biggest contributor to the book industry's carbon footprint is the use of virgin paper. According to the report, forest and forest harvest impacts have 62.7% share of total carbon emissions. Second is paper production at the mills with 22.4% share. Methan releases from landfilled books contribute 8.2%. btw - the total carbon footprint of the industry is 12.4 million metric tons or 8.85 lbs. of carbon dioxide per a book (2006 figures). 2. According to the U.S. EPA, books accounted for 762,000 metric tons of paper in Municipal Solid Waste - way too much! Top literary agent Bill Gladstone tells how his father may have triggered the practice of "returnable books" during the 1930s. Click here. A bookseller orders with care, and receives 10% more margin. Copies that don't sell as expected are marked down in stages, even to as low as 50% of retail. "Remaindering-in-place" creates a marketing lure for bargain-hunting customers, who often also buy another title at full price. Expenses for shipping, staff time and accounting have been reduced significantly. Accounts are paid on 60 days basis. The operation is now quite profitable, providing the owner with the resources needed to evolve during the inevitable decline in printed book sales. Maybe add a café or pub? Sell gifts or garden supplies? Retire? To support new works by Canadian authors, the bookseller receives an additional 5% to 8% discount during a title's first 90 days [this incentive is underwritten by the Canadian Heritage ministry which has phased out BPIDP grants]. For a book signing event, extra stock (still owned by the publisher) has been shipped to the store to instantly fulfill a re-order on the spot, if required. Afterward, the publisher's helper takes any extra copies to the next event. A publisher sends out POD galleys to stores and chains, and gets firm orders, then prints the appropriate quantity. Although the initial print run quantity is less, digital direct-to-print offset printing means re-orders can be filled promptly and economically. When demand tapers off, print-on-demand can be used. There is no 6-month wait for returns, no 12-month wait for invoices to be paid. Your profit margin on sales is larger because you are paying much less for freight and to the distributor. Angst has been reduced. You can nourish authors and pet projects. The banker smiles at you. Total revenues for US publishing were $3.71 billion for the first half of 2009 (the slow half of the year), according to BusinessWeek, who were quoting the Association of American Publishers in an online article on September 22, 2009. That would make savings in the US -- if publishers simply stopped selling books on a returnable basis -- of more than $1.48 billion each year. Was it Mark Twain who said, "there are lies, damn lies and statistics"? However you cut it, incredible and shameful amounts of money and natural resources are being squandered.